If you're looking for physics project ideas you came to the right place! Here you will find several ideas for cool physics projects. These projects are not the typical "cookie cutter" types you often see repeated in books. The projects described below are particularly interesting because they have practical relevance in real life. As a result, you will get more out of them while working through them. And you will retain more knowledge after you're done working through them. This is an experiment I worked on once. 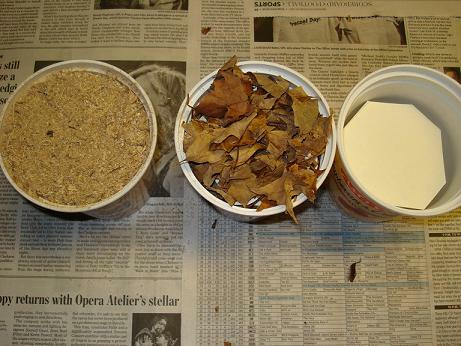 I tested the insulation value of sawdust and leaves to see which one worked best. I won't reveal the results of my experiment since that would spoil the fun, but I'll show you pictures of the basic set up I used. 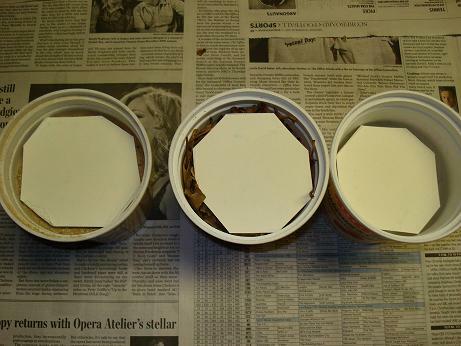 The figure below shows three large yogurt containers with smaller cups inserted inside. In the space between cup and container (including the space underneath the cups) I placed insulation material. 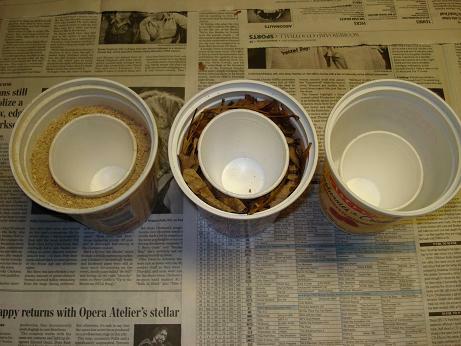 The first cup on the left has sawdust as insulation. The cup in the middle has leaves as insulation. The cup on the right has no insulation – this is the control which serves as a base reference used to compare the effectiveness of the insulation materials. Inside the cups you place equal amounts of ice, by weight, from the same freezer. The goal is to see which cup slows down the melting of the ice the most. This tells you which insulation material works best. After you have placed the ice inside the cups you can seal them. What I did was place a cardboard lid on the cups, and on top of the lids I placed insulation material (for those two cups where insulation material was used) – this way you have insulation all around. This set up allows you to easily check how fast the ice has melted after some time has passed. This set up is shown in the figures below. 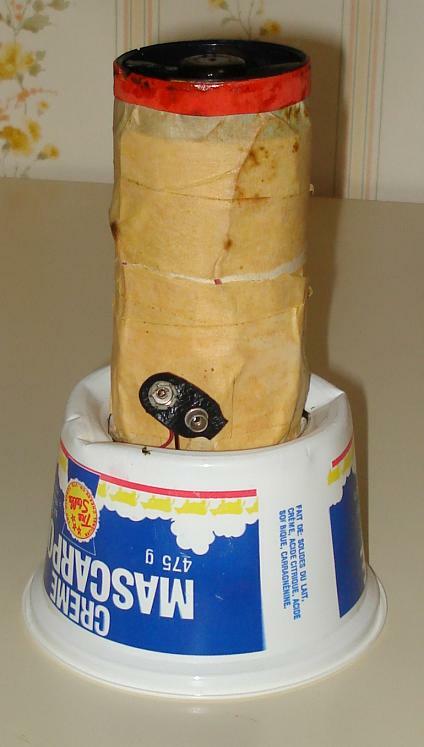 If you like, you can also test the insulation value of other materials, such as old newspaper, styrofoam, etc. However, the insulation potential of sawdust and leaves is particularly useful because they are inexpensive natural materials. Sawdust is readily available from any wood shop, and leaves are abundantly available in Autumn, as they fall to the ground. Calcium Chloride salt has an amazing property. It absorbs water from the air, thereby acting as a natural dehumidifier. Calcium Chloride is also the ingredient in several deicers used to melt ice and snow. So you can buy it in stores during the winter months. If you don't see the name "Calcium Chloride" on the deicer, look for CaCl2. This is the chemical name for it. To observe the effect, the Calcium Chloride can be sprinkled in a shallow container with a large area, as shown in the figure below. You can place a pan underneath the container to avoid any potential leaking onto the floor. In the figure you can see that the salt is mixed with traction sand. Sand is commonly added to deicers, but it will not affect the ability of the salt to absorb water. To increase the rate of water absorption you can place a fan near the container, facing towards it. The flow of air over the Calcium Chloride will help it to draw in more water from the air. 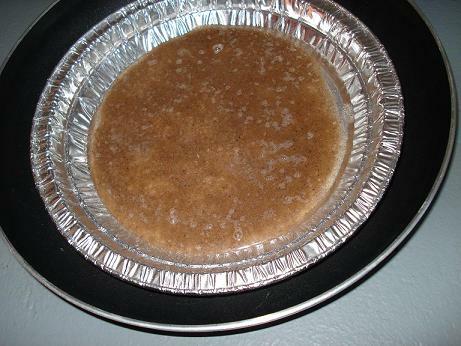 After 2-3 days it should be completely saturated with water, and you will have a brine. 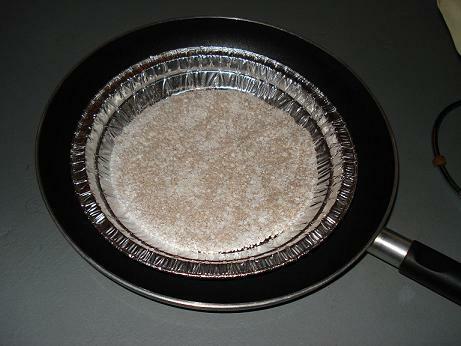 To regenerate the salt you can place the brine in a metal pot over an outdoor barbecue. 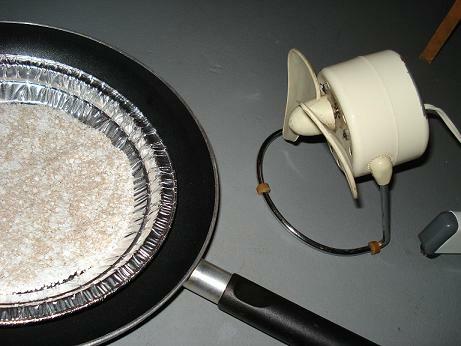 The high heat will evaporate the water allowing you to reuse the salt. For this project you can explain how the Calcium Chloride absorbs water. What is the physical process taking place? And how well do other salts (such as table salt) absorb water from the air? We've all seen barometers that use dials to read pressure. But how do they work? If you take one apart you can find out how. Here's the basic principle behind it: A partially evacuated sealed metal chamber responds to changes in air pressure by flexing. 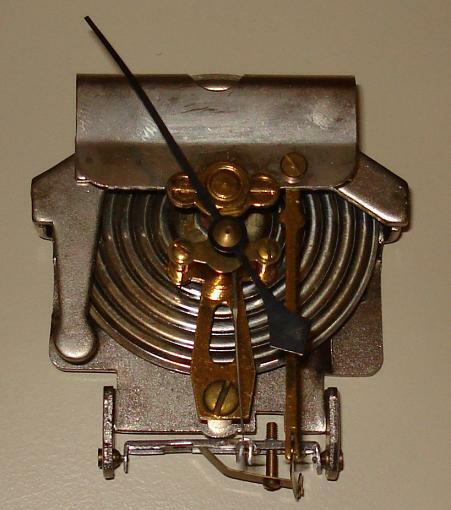 This flexing moves delicate levers which are attached, via an intricate mechanism, to a dial. Therefore when the air pressure changes, the dial turns. It's all calibrated of course. The challenge is to describe the movement of the dial in mathematical terms, and understanding how the mechanism, which turns the dial, works. Another good question is, is it possible for the dial to turn in response to changes in air temperature without any changes in air pressure? What is the reason for this? The figure below shows the mechanism from an old barometer I took apart. You can make a small hovercraft using everyday materials. For my senior high school physics project I made one. What I did was get two blowdryer fans, connected them in series using tape, and wired them so that they could be powered by an external power source. For safety reasons, the power requirement should be low, so the power source should be either batteries, or a small toy transformer; such as the kind used for toy trains. 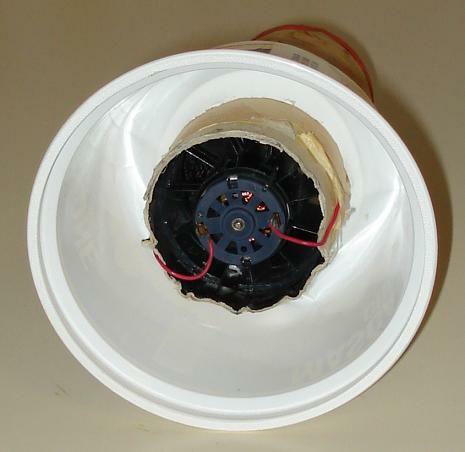 I then inserted the fan assembly into a hole cut into a plastic container. 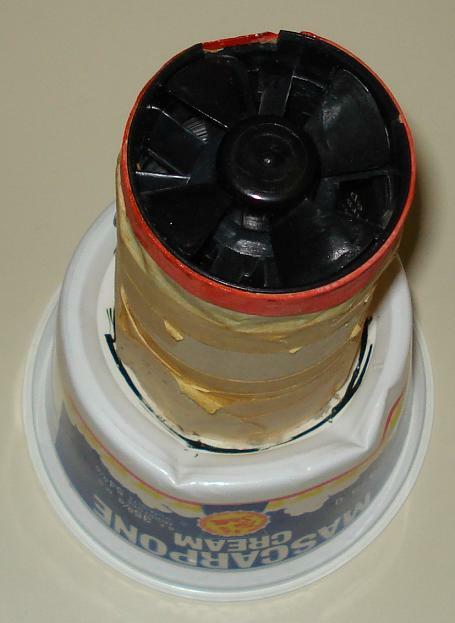 When I turn the fans on, they blow air into the container which pressurizes the chamber, causing lift. The result is a miniature hovercraft that floats on a thin cushion of air. The figures below illustrate my construction. You can easily build one yourself, perhaps experimenting with only one fan instead of two. You can then describe the physics behind the lift. The lift is generated by pressurization of the chamber which causes separation between the surface and the cup. The separation gap is such that the internal pressure force inside the chamber is equal to the weight of the hovercraft. Mathematically, you can determine the size of the gap depending on the fan power and the weight of the hovercraft. Explain how a gyroscope works and where it is used in real life. You can build or buy a demonstration gyroscope which shows gyroscopic motion in action. The behaviour of a gyroscope is explained on my web page: Gyroscope Physics. Explain how a trebuchet works, and build a small model version of one. A description of the trebuchet is given on my web page: Trebuchet Physics. Explain the Magnus effect and where it applies. Hint: The Magnus effect commonly applies to sports such as golf, baseball, tennis, and soccer.